Before he left the house each day, he'd carefully choose one from the rack and don it. The hat always seemed to fit his mood – or the occasion – perfectly. My dad's gone now but my mind somehow keeps coming back to those hats. People don't really wear hats much anymore, I suppose. It's become an affectation or a fashion statement. In those days, it was something more. A symbol of optimism. That we cared about quality, polish and finish. A subtle, personal signature. From an era when taking the time to do it the right way mattered. 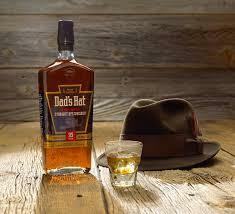 We founded Dad's Hat® Rye because we, too, want to do it the right way. To take up a tradition and make something that mattered -- by hand, in small batches, using only natural, local ingredients and the most careful methods. Dad's Hat is made right here in Pennsylvania – the birthplace of genuine rye whiskey – in honor of my father, who enjoyed rye whiskey and served it at the family's tavern, and of that wonderful, optimistic time in America's history when we made a lot of things and took care to make them well. My heart tells me that many of us are searching for that spirit again. We believe Dad's Hat® Rye reflects that same simple, uniquely American personality better than any other whiskey. Crisp. Smooth. Delicious – not lingering or heavy-handed in its finish. Perfect for every occasion. After tasting Dad's Hat®, we hope that you feel the same way.